This fall, more than 60 older adults from Ecumen Seasons at Apple Valley and Parkshore Senior Living in St. Louis Park are warming up their voices at VocalEssence Vintage Voices rehearsals. 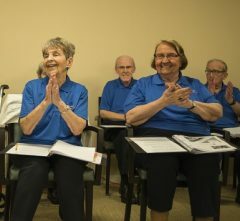 Vintage Voices, a program of VocalEssence, brings the many benefits—physical, psychological, and social—of choral participation to older adults. It removes barriers to engagement and participation by meeting seniors on their own turf—at senior living and community centers. The 12-week program, led by VocalEssence conductor Rob Graham and accompanist John Jensen, and supported in part by the Minnesota State Arts Board and individual donors, integrates regular arts practice into the lives of participants with weekly rehearsals. After months of learning and collaboration, seniors get a chance to share their hard work and newfound skills with a public, end-of-season concert. We also just received word that our Minnesota State Arts Board Arts Access application for 2018 was approved! We will be able to continue our work with VocalEssence Vintage Voices in four sites this winter and next fall, including Sabathani Senior Center, The Waters of Edina, Hallie Q. Brown Community Center, and Pillsbury United Communities. Learn more about the VocalEssence Vintage Voices program by contacting conductor Robert Graham at 612-547-1458 or emailing robert@vocalessence.org.